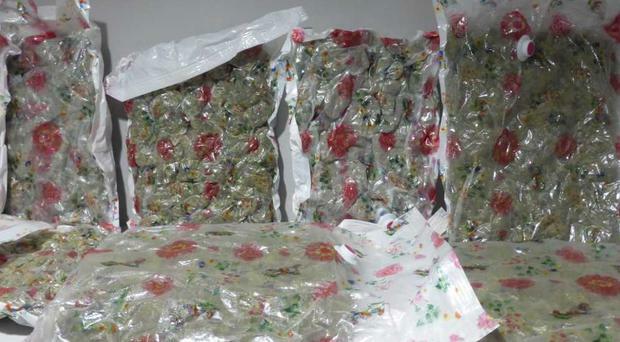 "£1 million drugs haul found in Belfast - two arrested"
"A man and a woman have been arrested after a £1million cannabis haul was seized by police in Belfast." "A 37-year-old woman in Stranmillis and a 48-year-old man in the Lisburn Road area were both arrested as part of an investigation into the supply of drugs in Northern Ireland on Thursday." "The arrests were carried out after searches by the PSNI's Organised Crime Branch discovered cannabis with a street value of £1 million." "The man and woman remain in policy custody." Yes i see they are up in court today. The PSNI have wild ideas about the net worth of drugs seized. If thats a million pound worth of weed i'm Jeremy Corbyn. Am i missing something? Where is Jeremy Corbin mentioned? Well done the PSNI, great work. Keep this filth off our streets. It was a £million worth of weed Jeremy. Exactly , it never once said that what was pictured was a million pounds worth . Exactly. I rest my case. For now. I apoligise. I completely mis-read your original post. "Home... News & Appeals... Latest News... [11/08/18] Pair charged over £1m cannabis seizure"
"Pair charged over £1m cannabis seizure" "11 AUGUST 2018 BELFAST"
Two people have been charged with a number of offences following the seizure of a substantial quantity of cannabis during a proactive police operation in south Belfast earlier this week. Detectives from PSNI’s Organised Crime Branch seized more than £1m worth of the illegal class B drug and arrested a 37 year old woman in Stranmillis and a 48 year old man in the Lisburn Road area on Thursday, 9 August. "These arrests and seizures are evidence of our ongoing commitment to disrupting the illegal supply of drugs in Northern Ireland." "We are glad to have prevented these drugs reaching the streets and to essentially have taken £1million from the hands of organised criminals who profit from the misery of others." The 37 year old woman and 48 year old man are due to appear at Belfast magistrates court this morning to face charges including possessing class B drugs, possessing class B drugs with intent to supply, conspiracy to supply class B drugs and possession of a false identity. As is usual procedure the charges will be reviewed by the Public Prosecution Service (PPS). Seems the PSNI dont know how much they seized. One says over one million then they later say they have taken 1 million off the streets. Then the PSNI chap with the bum fluff beard and tash says "We are glad to have prevented these drugs reaching the streets and to essentially have taken £1million from the hands of organised criminals who profit from the misery of others." So what other drugs did they seize as it was only cannabis in the article. The value of the seizure is almost secondary. Most people know that the cops always price a seizure on it's street value, not on what the dealer buys it for or what it's worth at production level. 'We are glad to have prevented these drugs reaching the streets and to essentially have taken £1million from the hands of organised criminals who profit from the misery of others." There is a much more simple and effective way of taking profits out of the hands of criminal gangs, which is to legalise it and to use the money raised for detox, rehab and hospitalisations, not to mention drug education and support facilities. How much longer will society sit back with folded arms whilst society burns ? That means burglary, armed robbery and murder in many cases, or something so seemingly insignificant as a stranger dying alone in a bin-chute covered in rain. Not to mention the exhorbitant costs involved in locking up those employed in the 'industry', border patrols etc. I don't personally hold out much hope that society will wake up to the truth in the next decade, maybe two, but it certainly will one day, once those who have never been exposed to drugs have passed away. When it happens, and it will, you can rest assured the days when we put drug profits into the hands of organised crime will well and truly be behind us. There is a very simple truth underlying this: the police are losing the war on an epic scale. They simply don't have the resources and they never will have the border resources to patrol a coastline the size of the British Isles or sufficient staff to police all airports. Nevermind the homegrown weed industry. Drug dealing is now a major industry in most British cities. It is estimated that you can order drugs, any drug, on a door to door delivery, quicker than a pizza. An industry which is worth over several billion pounds per annum and not a penny paid in tax. Who cares ? Is it not enough that a large quantity of potentially damaging illegal drugs have been taken out of circulation without looking for a conspiracy theory ? Hear hear, who cares indeed ? The important thing is that this gateway drug is kept of the streets of Northern Ireland. Why do you ask that question? Like you say, the article is only about Cannabis.